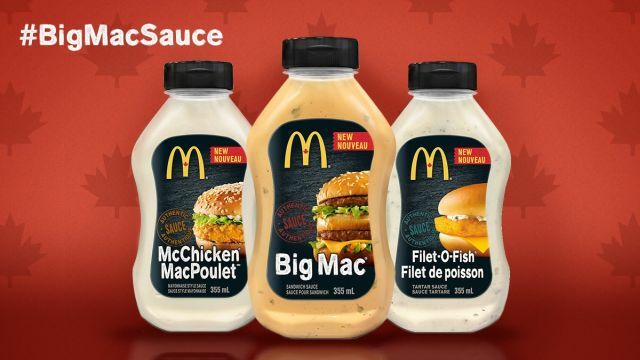 McDonald's looks to invade the condiment aisle of Canadian grocery stores this spring with the upcoming launch of new Big Mac, Filet-O-Fish, and McChicken sauce bottles. In case you're wondering what Filet-O-Fish and McChicken sauces are, they're McDonald's versions of tartar sauce and mayonnaise, respectively (just like Big Mac sauce is their take on Thousand Island). The sauces will come in 355 mL plastic squeeze bottles. A specific launch date has not yet been announced. 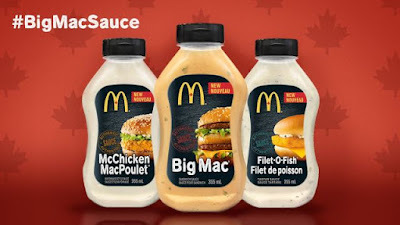 Given the proximity and recent giveaway of Big Mac sauce bottles here in the US, it wouldn't be surprising if the new sauces find themselves spread (pun intended) south of the Canadian border in the future.